David Baker, founder and principal at David Baker + Partners Architects, is a huge proponent of the protected bike lane near his Second Street offices in San Francisco. It’s crucial for keeping his employees safe on the way to work, he said. He also admitted liking it for “selfish” reasons. “I own the office. I know that if we have protected bike lanes out there, it will improve my property value,” Baker told researchers. There’s data to back up this claim. A 2006 study found that in Minneapolis, median home values rose $510 for every quarter-mile they were located closer to an off-street bikeways. In Washington, D.C., 85 percent of nearby residents say the 15th Street bike lane is a valuable community asset. Founders of the Portland-based advertising start-up Pollinate used the firm’s location in central Portland, and the nearby bikeways, to attract and build its team. About two-thirds of the company’s employees bike commute at least occasionally. Pollinate’s experience seems to be a part of a larger trend. Several recent studies have shown that younger people are increasingly disenchanted with driving. The percentage of people age 16 to 24 with driver’s license is lower than at any point since 1963. And among people 16 to 34, bike trips have increased 24 percent. According to a 2003 study by the U.S. Department of Health and Human Services, “workplace physical activity programs can reduce short-term sick leave by six to 32 percent, reduce health care costs by 20 to 55 percent, and increase productivity by 2 to 52 percent.” While we don’t know how much of those effects are due to biking, the benefits of integrating physical activity into daily routines are indisputable. 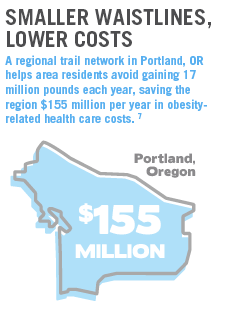 That’s one of the reasons why Kaiser Permanente Northwest was a big supporter of new protected bike lanes outside its headquarters in Portland. Human Resources Director Shannon Mayorga said active commuting could help the company reach its cost-cutting goals. 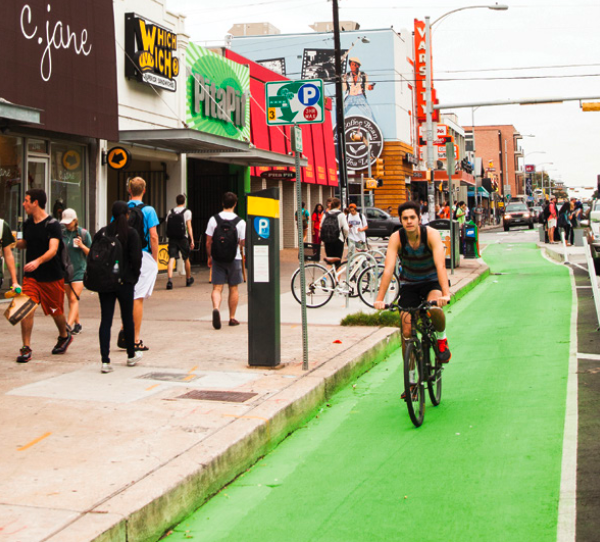 There’s plenty of evidence that bike infrastructure gives retail businesses a boost. According to a San Francisco State University study [PDF], 66 percent of shops on San Francisco’s Valencia Street reported business improved after the city reduced the width for cars, and widened sidewalk and added bike infrastructure. A 2008 Australian study showed that per square foot, bike parking produced more than three times the revenue for businesses than car parking in an hour. Tim League, founder and CEO of the Alamo Drafthouse Cinema in Austin, has seen the results in his own community. “and people can stop anytime they want to.” Yes, I find myself braking and hopping off if I see something interesting or remember that I need to buy something at a store I’m riding by. If there is nice bike rack parking in front of the store, I’m more inclined to run in and buy something, like the other day at a produce store on Valencia. I have driven past numerous shopping centers almost every day for the past three years, but I have no idea what stores are in any of them. I was surprised to discover today that a major chain was in one and I *never* knew! I went there after work, a shopping center on a 45mph 6-lane thruway, but with all the shops facing the parking lot and not the street, and I could not believe all the stores that were there! Speeding past the shopping center’s very narrow street-front at 45+mph, I could never see what was in the building, or their complex store sign by the street. Car-centric development and city planning is a disservice to local businesses! Have you told them that if they rezoned to force more dense development and less unused parking wasteland that they would generate more tax revenue to then be able to afford bike lanes? And do they spend any money on car infrastructure? Sometimes we have to call liars just what they are: Lying liars. The link to the SF State study is broken. Can you please fix it? Thanks!